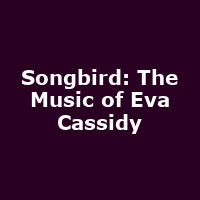 "Songbird: The Music of Eva Cassidy is a fantastic concert performance which also tells the story of one the greatest singers of the 1980s and 1990s. The music of Eva Cassidy only came to prominence in this country following her untimely early death but since Terry Wogan first played her recordings in 2000 she has had three No:1 UK hits and a total of eleven UK chart hits, including five top three albums. Songbird stars Sarah-Jane Buckley who has already made her name as one of the world's leading Eva Cassidy interpreters and of whom the press said 'her voice is almost an exact copy of the original', Sarah plays Eva to perfection and 'with a beguiling blend of power and tenderness she performs every song with expert precision'. Supported by a brilliant on-stage live band, fantastic video footage and classic Eva Cassidy arrangements of some of the best songs of the late 20th century Sarah-Jane Buckley presents a show which has already been hailed as 'a tour de force performance that is nothing short of phenomenal.'"